BALTIMORE (AP) — Oakland’s Khris Davis had another great day. Baltimore’s Chris Davis had yet another awful one. 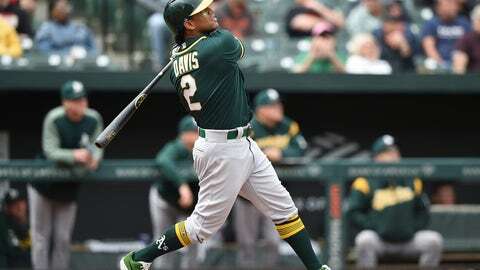 Khris Davis hit a pair of home runs for the second straight game, increasing his major league-leading home run total to nine and leading the Athletics over the Orioles 8-5 Thursday. Chris Davis was 0 for 3 with a walk and extended his record hitless streak to 53 at-bats. In the fourth season of a $161 million, seven-year contract, he is 0 for 32 this season and hasn’t gotten a hit since Sept. 14, setting the mark for most consecutive hitless at-bats by a non-pitcher. Josh Phegley, Kendrys Morales and Marcus Semien also homered for the A’s, who won three straight after losing the series opener. Oakland hit 16 home runs in the series. Dylan Bundy (0-1) gave up six runs and seven hits in five-plus innings with eight strikeouts, and he tied a career-high by allowing four homers. The Orioles have given up at least one home run in all 13 games this season. Khris Davis gave Oakland a 2-1 lead with a two-run home run in the fourth, and Phegley boosted the margin to 4-1 with a two-run homer in the sixth. Davis and Morales hit back-to-back home runs in the sixth that ended Bundy’s afternoon. Dwight Smith hit his first home run for the Orioles in the first inning, and Pedro Severino was hit on the helmet by a curveball from J.B. Wendelken with the bases loaded in the seventh. Semien hit a solo homer off Mychal Givens in the ninth. The Orioles went 1-6 on their first homestand, allowing 28 home runs over that stretch. Orioles: Baltimore recalled LHP Tanner Scott from Norfolk and selected the contract of RHP Josh Lucas from the Triple-A club. Lucas allowed one run and one hit over two innings. Scott gave up a pair of hits and had a strikeout in one-third of an inning. Athletics: 1B Matt Olson is taking ground balls and working on his conditioning after offseason surgery on his right hand. He is also taking one-handed swings in the batting cage. Orioles: LHP Richard Bleier (shoulder tendinitis) was placed on the 10-day IL, retroactive to Wednesday. Athletics: RHP Mike Fiers (2-1, 5.94 ERA) is scheduled to make his major league-leading fifth start this season on Friday against Texas. Orioles: RHP David Hess (1-1, 2.70 ERA) starts the opener in Boston against LHP Eduardo Rodriguez (0-2, 12.38 ERA).